Tile Doctor Vinyl Strip is an effective heavy duty floor polish stripper that quickly removes polish and films and coatings from vinyl floors. The special formulation enabled the removal of heavy dark polish build-up that can occur around the edges of rooms additionally its biodegradable, phosphate free and leaves a pleasant floral fragrance. Suitable for use on Amtico, Karndean and all other types of vinyl tiles or coverings. 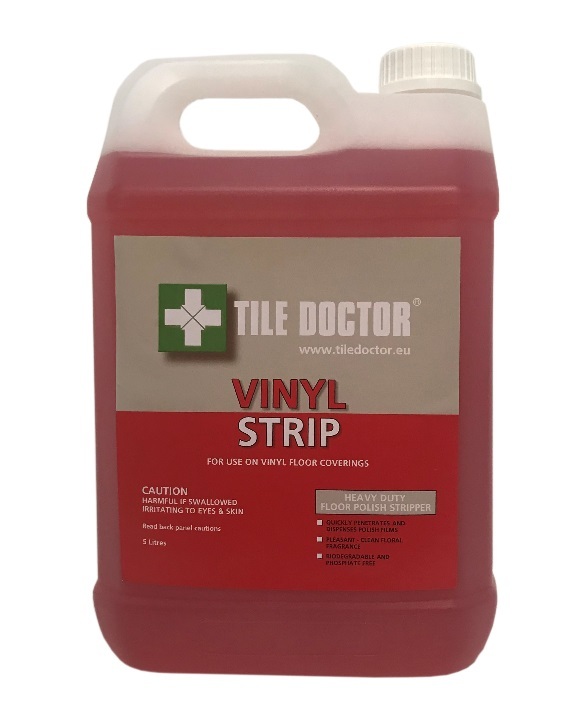 Tile Doctor Vinyl Strip should be diluted at 1 part product to 10 parts of cold or warm water. Apply to the floor and leave for up to 15 minutes to soak in. Scrub the floor thoroughly with a scrubbing machine fitted with a nylon scrubbing or red buffing pad, alternatively a stiff deck brush will surfice. The solution should be removed from the floor by either mopping or extracting with a wet vacuum. Available in 5 litre bottles at £39.00 each, Postage and Packing £10.00 for one or more bottle (All prices are shown inclusive of VAT).